My thoughts, views, and ideas on teaching, higher education, technology in education, and living the professor-life. 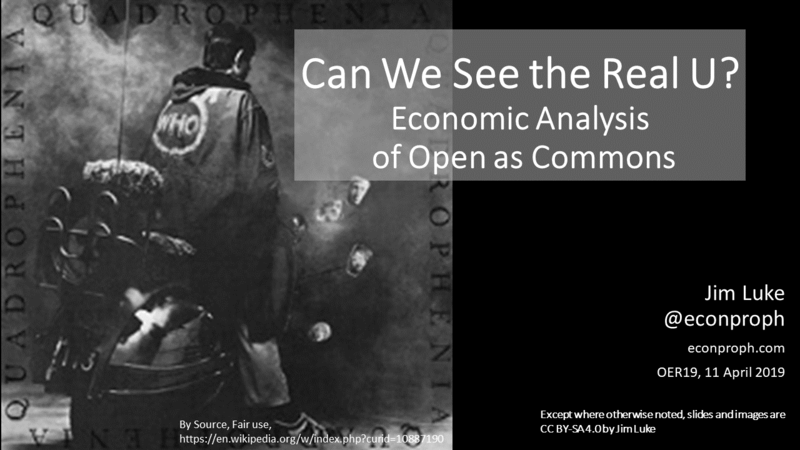 Note this is most of the abstract for today’s presentation at OER18 in Bristol, UK entitled “Commons of Our Own”. I’ve embedded the slides for the presentation at the end. Disclaimer: This is the advance abstract written months before I created the slides. We’ll see what I actually say today. I’m kind of curious about that myself since my current thinking is a bit different from when I wrote the abstract. Time moves on. I plan to write and publish a longer form blog post with what I actually end up saying and explaining in more detail. With some luck that longer form post will happen this weekend. Stay tuned. entire chapter to “Domains of One’s Own” (DoOO) projects. called it the Open Learn Lab. 2014). The technology remains mostly WordPress sites, similar to DoOO. creating the digital eco-system Bass and Eynon envision. student blog sites and course hubs which we see as “on ramps” to DoOO. engagement both within the campus community and the larger public community. student blogs. 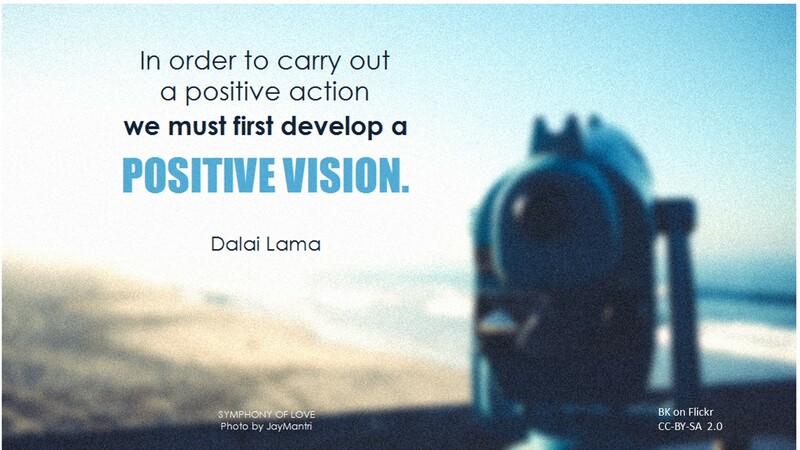 Early indicators point to success. Bollier, D. (2014) Think like a commoner, New Society Publishers. Lisa Petrides, Douglas Levin, and C. Edward Watson recently released the CARE Framework, but apparently some people, David Wiley in particular, don’t care for the framework. Stephen Downes has already I think responded in two brief posts here and here. Stephen’s posts are brief and I think pretty spot-on. Nonetheless, I’ll soldier on and try to use a couple thousand words to say the same thing. I find the Framework both exciting and timely. As I’ve mentioned before, I’ve been making up for lost time studying the economics of the commons. In particular, I’ve been deep into Elinor and Vince Ostrom’s work, as well as David Bollier’s work. The Framework doesn’t explicitly state that it is about a “commons” but that’s what they are describing. A commons. A true commons as Elinor and Vince Ostrom would describe it. 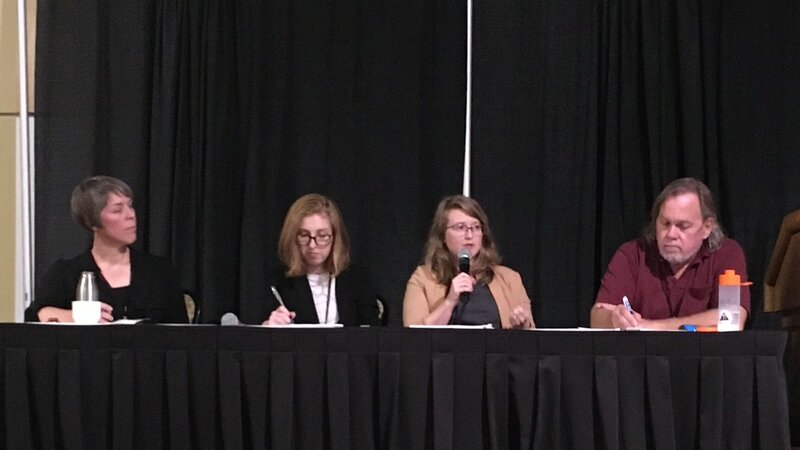 People serving as OER stewards pursue a wide variety of strategies and tactics relevant to their specific context to improve access to education and opportunity over time. Yet, what all good OER stewards should have in common is a commitment to practices that serve to demonstrate their duty of care to the broader OER movement. The Framework is a great start towards a community definition of our own Open Education Commons. I hope to make more contributions along these lines this year. It’s part of what I will talk about at OER18 and OE Global18, and it’s what I’m drafting papers and posts about. The CARE Framework emphasizes “membership” and “stewardship”. It uses words like contribute, attribute, release, and empower. These are verbs. The commons is a verb. 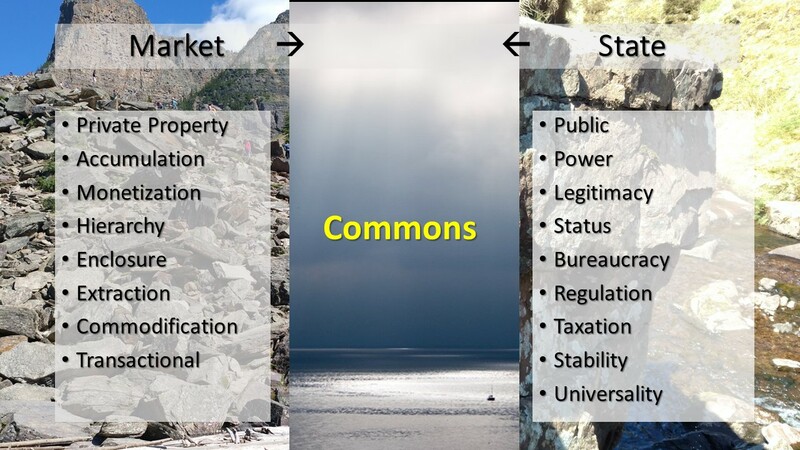 A commons is all about governance, behavior, social norms, production, and usage. It is a social-economic system. It is not a pool of objects or nouns that a bunch of people share. Wiley dismisses this. He makes a nod towards Elinor Ostrom and tries to cite her work on the commons as supporting his. He misses. It may be a compliment to Ostrom. The mark of a legendary, brilliant economist is after their death they are widely cited or quoted by legions of ppl who neither read nor understood what they actually wrote. Adam Smith, Marx, Keynes. Elinor Ostrom has assumed that status now apparently. The CARE Framework attempt to define membership boundaries in what I’ll call the open education commons (I have good reason to say OE commons, not OER commons – bear with me). Wiley admits that defining group boundaries is Ostrom’s first principle of managing a commons. But he dismisses the Framework and any effort to define group membership, and thereby any behavioral norms, by denying that we should even consider OER as a commons. It’s here where he abandons Ostrom and returns to the old “tragedy of the commons” analogy. He invokes the idea that commons thinking and commons ideas only apply if we’re discussing physical, natural common pool resources. He asserts that rivalrous goods are necessary for such common pool resources and then asserts OER are not rivalrous goods. Indeed, he sets up a straw man using the old Garrett Hardin story of the tragedy of the commons wherein a “commons” is defined to be = open, unlimited access to a scarce, limited natural resource. The analysis is static and he gets lost in the terminology. The first problem is that common pool resource(s) are not the same as a commons. That’s Ostrom 101. It’s difficult to read Ostrom or listen to her (fortunately there are many extant videos online of her lectures) and not discover the fatal flaw in Hardin’s “tragedy of the commons” story of over-grazing (or over-fishing or over-hunting). Hardin’s “tragedy” describes a common pool resource where there was no commons structure or social norms governing behavior. It did not describe real-life commons scenarios. Ostrom studied real-life cases. In the Hardin “tragedy” it’s unlimited access by strictly self-interested, socially-detached, profit-maximizing individuals that did not practice stewardship. Interestingly, Wiley denies there’s any possibility of “tragedy” of OER commons while he advocates for OER precisely the hypothetical regime of Hardin’s “tragedy”: unlimited use of CC licensed educational materials without consideration for community norms or commons governance or stewardship or recognition of being in a “community”. The second problem is Wiley’s assertion that OER materials are “non-rivalrous”. Wiley supposes lack of rivalry in OER goods inoculates OER from any of the risks of unsustainabilty or failure of what I’ll call the OE commons. Here we’ve got three sub-issues: Are non-rivalrous goods exempt from concerns of sustainability? Are OER non-rivalrous and cost-free to reproduce? And finally, just what is the scarce resource jeapardizing sustainability? Wiley is dead wrong in his assertion that non-rivalrous goods are the only subjects of common pool resource concerns or commons concerns. He implies that Ostrom and her work on the commons only applies to rivalrous goods like natural resources (even here, not all natural resources are rivalrous. Rivalry in goods is contextual and depends on demand, supply, and property regimes). It is true that knowledge and ideas are non-rivalrous. But even non-rivalrous goods can be managed quite successfully as a commons and can also face challenges of sustainability and governance. Ostrom co-authored and co-edited Understanding Knowledge as a Commons. Her work inspired the Workshop on Governing Knowledge Commons. It’s a gross misrepresentation to suggest that Ostrom’s work on commons governance and membership applies only to natural resource pools that are rivalrous. Even non-rivalrous goods face challenges of sustainability that need to be addressed by commons stewardship. But let’s look at Wiley’s assertion that OER materials are non-rivalrous. His evidence for this is based on the tired canard that making digital copies is virtually free and we can make unlimited copies. But even in an all digital document file world (and not all OER are digital document files) the cost of copying is not zero. Disks, networks, computers, software all have costs of both acquisition and maintenance. They also bring questions of privilege and access. The marginal cost of copying may be very, very small. But marginal cost isn’t the end all of the analysis as any good economist knows. OER reproduction is not cost-free. To have a very, very low marginal cost still requires substantial investment in infrastructure, fixed costs, and sunk costs. Further, just how does one costlessly copy a digital OER resource and avail themselves of all the 5 R’s when the source code files for the website aren’t provided or come in such a format that discourages it. Ask the many faculty who have tried to download, edit, and remix some OpenStax texts. Time is a cost too. Wiley himself sees this when elsewhere he argues that very few have the resources or luxury to contribute to the “hard, frequently painful, and seldom recognized work associated with stewardship.” Clearly OER materials are not cost-less to reproduce and that alone means we must be concerned with sustainability and behavioral norms of stewardship. A great deal of confusion in thinking about OER sustainability – or what I prefer to think of as sustainability of the OE commons – comes from confusion in terms. In particular we’re confused about “resources”. We use the word resource in OER and then we encounter research about the commons and CPR’s, common pool resources, and confusion ensues. Economically, a resource is something that is necessary for the production of other more economically valued goods or experiences. Resources do not have to be physical objects. The traditional taxonomy is land, labor, and capital, although I think most economists today would not object to adding knowledge in some form to that mix. In economic terms, what we call OER’s are resources used as part of the teaching process that produces some learning. Note: Please bear with me, my critical pedagogy folk. I’m applying economics to teaching here at a very abstract, general level. I am not embracing learning outcomes, learning analytics, or engineered corporate “learning” experiences. Teachers who engage pedagogies and activities that result in student agency or transformation can still be viewed as a production process in the abstract even if it’s artisanal, unpredictable, and unmeasurable. Yes, teaching materials such as textbooks, quizzes, images, and software are resources in the teaching or educational process. They are one of the resources. If those materials are free to access, to use, to revise, to adapt, etc, then we call them OER. The use of the word “resource” is legit in this context. However, are these resources fit for purpose? And by fit for purpose, I mean are do they synergistically amplify the most critical resource of the process, the labor and knowledge of the teacher? To make them truly fit for purpose requires engaging the 5 R’s. We must remix, revise, redistribute, and edit. It is not enough to have or use an OER with permissions for 5 R’s if we do not or cannot actually do them. I may have the right or permission to vote, but if I do not actually vote that right is meaningless. To actually revise, remix, redistribute, or edit OER’s requires additional resources. The critical resources necessary for OER are people’s time and expertise. This is true for both the creation of those mass distribution OER’s such as general ed course textbooks and the materials as used in each class. I think of the textbooks as wholesale or bulk OER’s that need further processing and supplementation to be most effective in any particular course. And who provides these critical resources of time and expertise for creation, editing, remixing, revising, and redistribution? The most critical source is faculty. Is faculty time non-rivalrous? Hardly. Accepting the economics definition of scarcity as “unlimited wants and limited resources”, we must conclude faculty time is scarce. It is valuable. Faculty make choices of how to use their time. They can choose to spend time creating, editing, revising, remixing, and sharing OER materials, or they can spend their time in a myriad of other ways. While OER materials are indeed resources in the context of teaching, in the context of our discussions of sustainability, they are not. OER materials are not resources and not the commons or the CPR itself. OER are the fruits of the an open education commons that utilizes a common pool resource of faculty time and expertise to produce them. If we think of it this way, we see why stewardship, the CARE Framework, and Ostrom’s principles are so important. OER materials are not some static, ever growing pool of materials that can endlessly and costlessly be copied, reproduced, and used. That OER textbook written two years ago? It might be out of date now. Who is going to edit and update it? Who cares if I can copy that text from a decade ago? Maybe OER’s cannot be over-used as David Wiley states, but they can certainly be under-produced. Under-production will lead to tragedy of the open education commons as surely as over-grazing might lead to failure of a pasture commons. Why would faculty devote their scarce time to OER? Why should they take time to attribute (and trust me attribution takes time)? Is it only because of threats of legal action should they not comply with copyright licenses? Hardly. That’s never stopped faculty before. It’s because they are convinced that they are part of a community, a commons, wherein this is the norm. Attribution is what good people do. As Downes put it, they want to respect, protect, and further the collective enterprise in which they are a part. Why would faculty devote scarce time to sharing and contributing their content or materials? All teachers have materials they’ve created for classes. Not all OER’s must be 300 page textbooks. There’s a wealth of unshared teaching materials sitting in faculty drawers in the form of handouts. Only a small portion get shared or contributed to others, partly because sharing and making available to others is not always easy. Time. Resources. Scarcity. Again, they share when it’s part of the social norm. What might discourage faculty from attributing or contributing? Faculty will not share, will not contribute, and will not attribute when they see that their efforts and time get abused by others who don’t adhere to the social norms. It’s not just over-use that can doom a commons. Enclosure and extraction can destroy a commons just as well. Another Ostrom principle of commons management is fairness. Faculty and all members of the open education commons need to perceive that fairness reigns. There’s been a steady drumbeat that says CC-BY license is the “most free” (how is it more free than CC0, I wonder?). But when I’ve worked with faculty to help them create, share, publish, revise, or remix their OER materials, their gut preference is typically for CC-NC, CC-SA, or CC-NC-SA. Why? Because they perceive those licenses as more fair. The NC and SA licenses make statements about “I’m contributing to the OER community. I expect fair reciprocity. I expect you to be a good steward too.” Faculty react quite negatively to organizations who charge for access to CC-BY materials. Faculty perceive those organizations as using legal technicalities to abuse the good faith efforts of the community. I haven’t yet presented the CARE Framework to faculty. My expectation is it will be warmly accepted and greeted with a kind of “well, of course”. I thank Petrides, Levin, and Watson for their work on it. While in many ways the framework simply captures what I think most faculty think and feel already, making the framework and its emphasis on stewardship explicit is a major step forward for the open education commons.